Black Trillium Fibres is in the business of bringing your color dreams to life. We do more than 300 repeatable regular colors, the broadest spectrum of ombres for crafters available, as well as limited edition gradients and color packs. This year we’re taking the guesswork out of big projects by adding dyed-to-order kits to our repertoire – our first, for Caitlin Hunter’s ‘Tecumseh’, is coming soon. 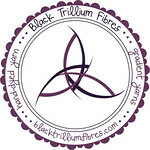 Check us out now at www.blacktrilliumfibres.com, and make sure to get on our mailing list for updates and sales info. Every hobby needs organization, every project needs a place. Erin.Lane bags helps you turn your fiber pasttime into neat and organized endeavor. Our project bags, totes, and needle and notions organizers are everything you need to keep your fiber arts from fraying. start date is May 1st. Page 1 is up in the top post of the thread in the Knitmore Girls forum. Jasmin has narrowed her choices down to Archer and/or Fading Lines. Jasmin has started the ribbing on the body of her Frozen Hearts sweater. Gigi found her sweater for the choose your own adventure: Fine Sand by Heidi Kirrmaier. 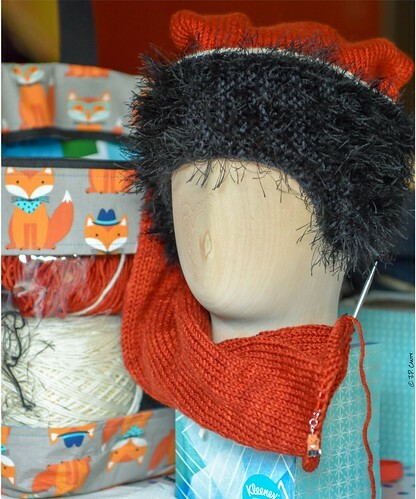 Jasmin is nearly done with the scarf section on the Fox hat for Rex, just in time for the sweltering heat. Gigi is knitting another pair of Vanilla is the new black socks out of a purple Fabel yarn from Stitches... 2017? She is also working on a pair of gray vanilla socks out of Regia. Gigi is working on Purlbreak, out of Oink Pigment yarn in oink sock. Jasmin knit a tiny bit on Rex’s BB-8 Sock Arms sweater. hat to make a cat hat. Check out the Knit Girllls, Rules will go up soon. the car. We like the Biobands. Gigi missed increases on a row on the Purlbreak. The NEW Knitters Template, by Laura Militzer Bryant and Barry Klein! Jasmin mentions Debra Newton and Ann Budd. Jasmin mentions the Victoria Wheel. Gigi's class at West Valley College is Flat Pattern Construction.